The rogue, Lord Samuel Travis, is back in town!!! But he gets thrown out from the family home and financial cut off by his brother, Nigel the marquess, due to Sam’s behavior. To obtain good standing with his brother, the rogue is tasked with evicting the people from a certain property. Easy task or so Sam thinks.....he believes he will be able to quickly evict the occupants and get back into his brother’s graces. Upon arrival at the property, Sam is in for a huge turn of events!! It is occupied by an eccentric uncle and his niece, Miss Juliette Lacey. Julie flat out refuses to leave the property. She is an unexpected spitfire who will do anything to protect family and their property. There is undeniable chemistry between Julie and the rogue but a task is a task and since they will not leave.. Sam moves in with them. Meanwhile the marquee purses Julie. He gives her an option or how to protect her family. Who should she trust?? There rogue decides to leave the property to rethink his life. Is it too late for Sam to reform, get an honest job plus win Julie’s heart from his brother?? The main characters plus the supporting characters were well fleshed out, realistic, relatable and very well defined. Talented descriptive writing made me part of all the action taking place around me. The intricately woven story with many unexpected twists and turns that will delight and entertain the reader. 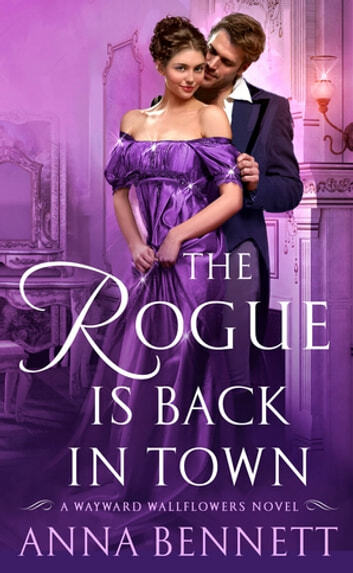 I volunteered to read The Rogue Is Back in Town. Thanks to St Martin Press via NetGalley for the opportunity. My opinion is my own. Lord Samuel Travis is a rogue and a wastrel. He has been drinking and womanizing even more since the death of his father. His older brother has had enough, and gives him a task to prove he is good for something. What starts as an unpleasant task will soon make an honourable man of him. Miss Juliette Lacey is the last of the "Wilting Wallflowers " unmarried. Her sisters have happily found wonderful husbands. Juliette is left to look after her adored Uncle Alistair. He is a rather unusual man. Unfortunately someone is about to turn her life upside down with some terrible news. She wants to try and solve this problem without disturbing her sisters and their husbands. A fun, historical romance with wonderful characters and a captivating story line. Just when you think you know what's going to happen, you find you don't. This is part of a series but each book can be read alone. They are all great fun. I have loved all of them. What's Not to Like About a Rouge? Heartwarming and surprising! I really enjoyed this story with several twists and turns. Lord Samuel Travis is the second son of a Duke and has always been at odds with his older brother. Now that there father has died, Sam returns home but soon his brother is fed up with him due to his debauchery. He gives him one last chance to redeem himself by throwing out the tenants of a house he owns so that he can sell it. Well as things often goes, the residents of the home, Miss Juliette Lacey and her uncle are not what he expects and he is persuaded by Julie to give her some time. Then the fun starts or rather the confusion begins!! The characters and dialogue kept me entertained and I did enjoy the storyline. Seeing the emotions build between Sam and Julie had humor and strong attraction with Sam determined to do better for himself. In the end, Love does find a way but you will be delighted at the path it takes to get there!! 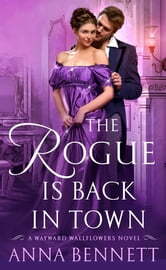 The Rogue Is Back in Town by Anna Bennett is book Three in "The Wayward Wallflowers" series. This is the story of Juliette Lacey and Samuel Travis. I have read the previous books in this series but I thought this is easily a standalone book. Sam has returned home after a banishment that he is now trying to put behind him. But he has fallen into his old ways which has left him in trouble with his older brother Nigel. When asked by Nigel to kick some people out of his property to get back into his good standing, Sam thinks he will have a easy time of it. But when he shows up to do what has been requested he faces Juliette who is not having any of it. Juliette stands her ground and asked for proof that this is his property....which puts them at a standoff. There was some questionable parts in this book that did have me pulling back from my 5 star rating but overall I enjoyed this book. I will be looking for my books by Ms. Bennett and can't wait for the next installment into this series. I received an ARC of this book from NetGalley to read in exchange for a fair review. The Rogue is Back in Town is the third book in the Wayward Wallflowers series by Anna Bennett. It can be read as a stand alone but it’s a great series so you should read them all. Juliette is the last unmarried Lacy sister but at the moment she’s got more on her mind than husband hunting, her beloved uncle seems to be losing his mental alertness and is having conversations with her deceased aunt, and now it seems they are going to be tossed out of their home. Sam and Nigel Travis may be brothers but they couldn’t be more unalike, one is respectable gentleman and one a reckless rogue, however things are not always as they appear and Juliette will have to learn to trust her heart and that home is not a house but the feeling you get when you’re with the person you love. I very much enjoyed reading this book. Sizzle level steamy. Will be published on January 2, 2018.